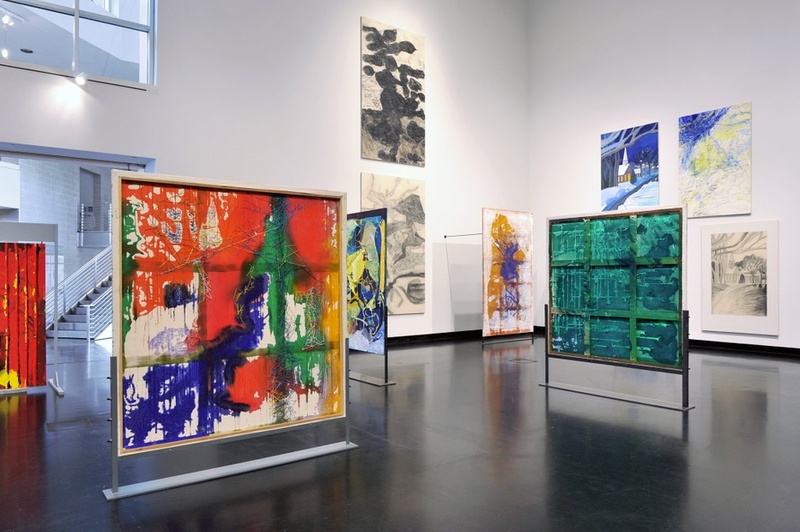 Dona Nelson, installation view, Tang Teaching Museum at Skidmore College. Contributed by Sharon Butler / Dona Nelson says she’s lazy because sometimes she would rather read a book than work in the studio. 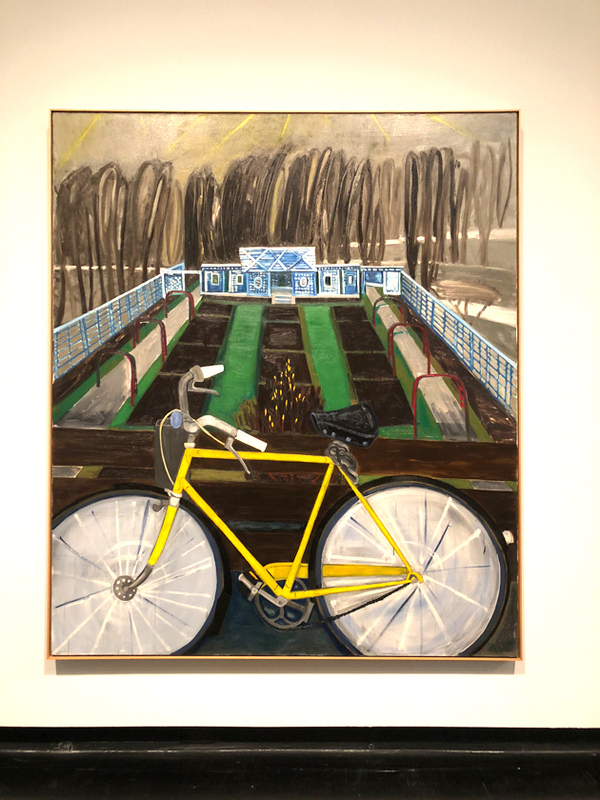 But “Stand Alone Paintings,” a recent mini-retrospective at Skidmore’s Tang Teaching Museum that includes thirty pieces ranging from the 1980s to the present, revealed an artist who is far from a slacker. Clearly Nelson is deeply engaged with the physical process of painting and the materiality of paint. The 71-year-old artist finds meaning not so much in image as in the kinetic process of slinging pigment. Having given up brushes and representational imagery long ago, Nelson embraces an anything-goes aesthetic and works with a distinctive, vibrant muscularity. Dona Nelson, a painting from the 1980s. This series of paintings is based on a pastel drawing her mother made when Nelson was a child. 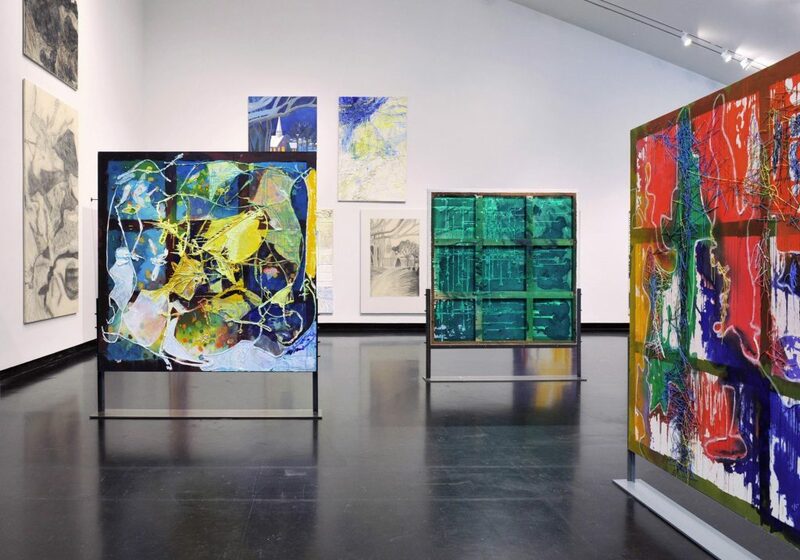 Deftly curated by museum director Ian Berry and installed salon-style in the Tang’s large atrium space, the show featured many large-scale two-sided paintings, with their highly saturated poured and spattered color, and her three-dimensional painting objects. 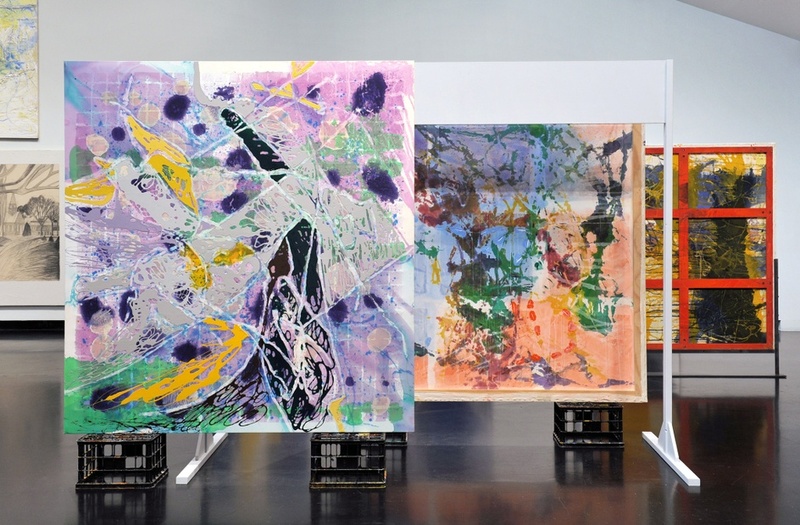 Nelson wants viewers to walk around her work rather than looking at it frontally, to see how the poured shapes and patterns on one side of the unprimed canvases seep through to determine the outcome on the other. Although the paintings from the 1980s feature traditional imagery – still life, landscape, architecture – in more recent years, Nelson has turned to process and abstraction. 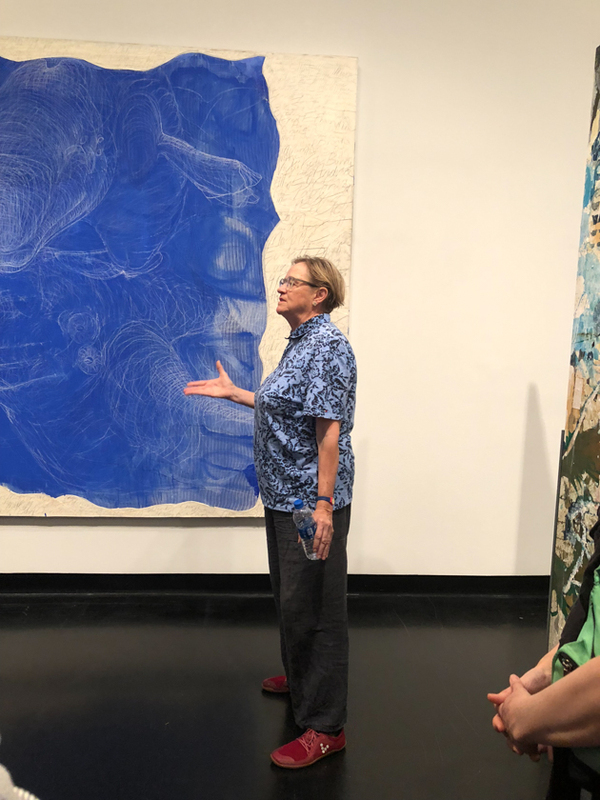 At the Tang: Dona Nelson talks about her work. 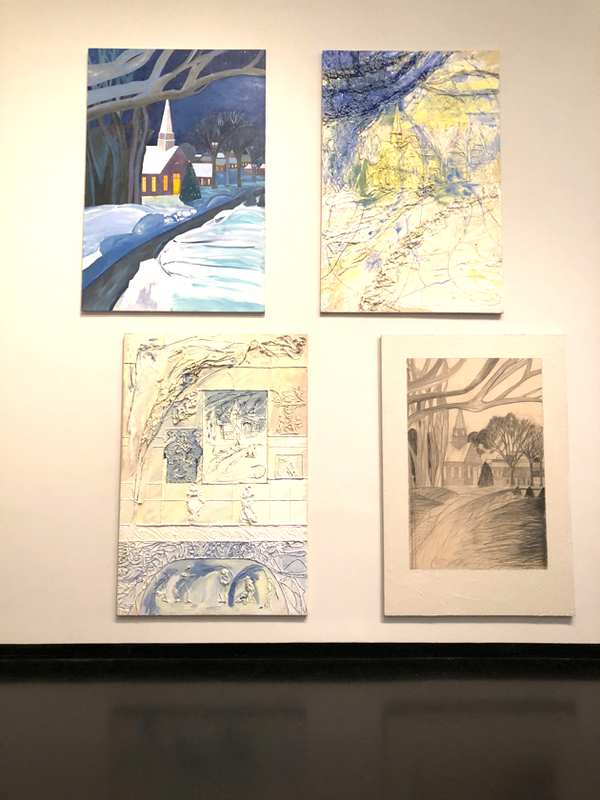 In an artist talk in July at the Tang, Nelson spoke about a series of paintings she had made that were inspired by a small pastel of a village that her mother had drawn in an art class when Nelson was a kid. In the process of creating large-scale representational paintings based on the village image, Nelson had an epiphany. She realized that she was interested in the enduring connection that binds one generation to the next. Rather than copying the imagery as she had been, she began exploring processes that mimicked the transference of content that occurred between Nelson and her mother, and, more generally, through all parents and their children. Working abstractly with a wide range of materials and tools, she made textured pieces and in turn used them to make rubbings that became the basis for subsequent work. Since then, Nelson’s belief that meaning in painting resides in the making has become both deeper and more expansive, incorporating twisted collage elements like painted yarn and cheesecloth, structural supports, architectural framing, and more. Where the process will take her is a nourishing mystery. She uses odd materials and methods, courting accident in a quest to create unpredictable and sometimes outrageous work. It may seem slapdash, but she is no casualist. Doubt is not in her playbook. Overworking is her go-to approach, and she continues working on paintings long past the point when she has made what others might consider a “good painting.” Theory or philosophy can’t explain her labor-intensive two-sided canvases. They unapologetically express her belief in action, embodying the exuberance and energy of an artist, who, once she gets going, is intensely industrious and manically creative. 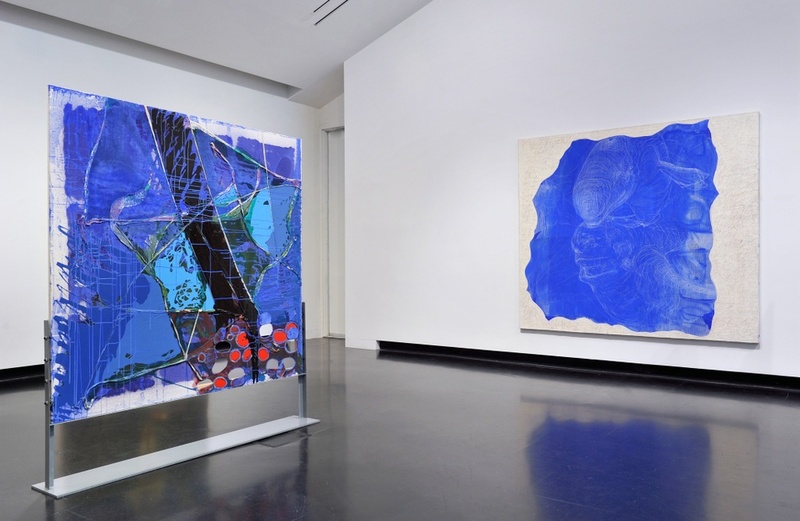 “Dona Nelson: Stand Alone Paintings,” curated by Ian Berry. Frances Young Tang Teaching Museum and Art Gallery at Skidmore College, Saratoga Springs, NY. May 12 through August 12, 2018. Dona Nelson was on a panel two weeks ago at CANADA, each panelist speaking about a painting that had an impact. She spoke about a little know (to me) Pollock, mostly black. After the talk I had a chance to talk with her briefly, which was informative and enlightening.